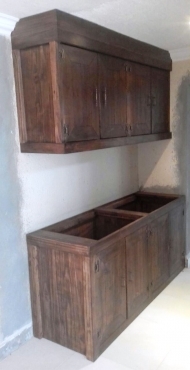 This stunning Combo is ideal for Rustic Kitchens and just an idea of what type of Kitchen cupboards we can do although we are not limited to these as we specialize in custom made furniture. Let us have your preferred dimensions and or available space and we will do a quotation for you. Kitchen tops excluded.